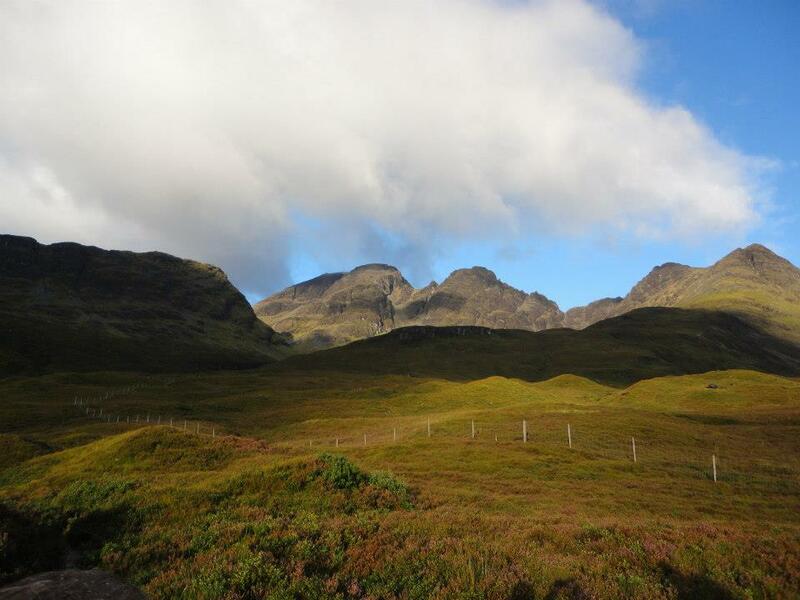 The islands peninsulas radiate out from a mountainous centre dominated by the Cuillin hills. 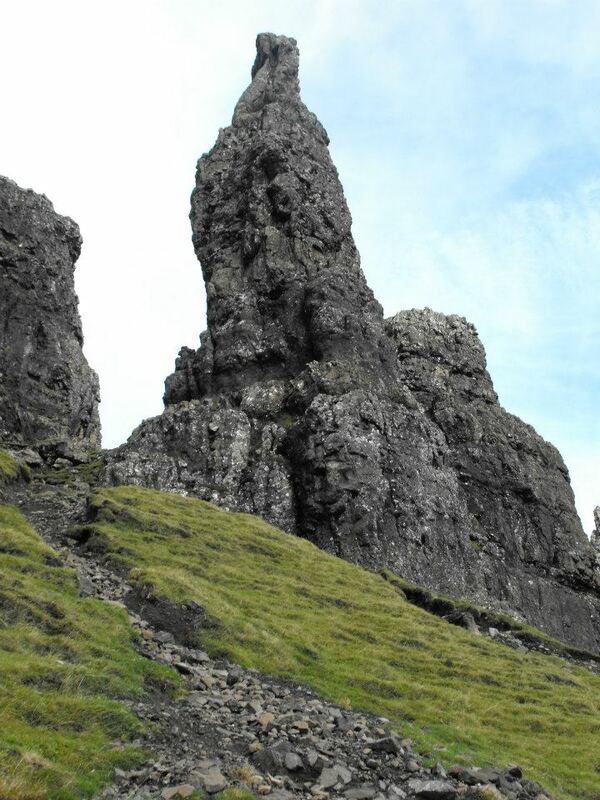 Skye is about 50 miles from north to South, around 25 miles from east to west at its widest. The coastline is very irregular and indented by sea lochs. In all it is approx. 400 miles long and I can’t think of a single mile that I would call dull. There is a lifetime’s worth of exploration on this Island! Population stands just over 10,000 and is rising; attracting people who value this exceptional lifestyle to the island. I would certainly love to live here – It really is the most beautiful place in the UK – fact! 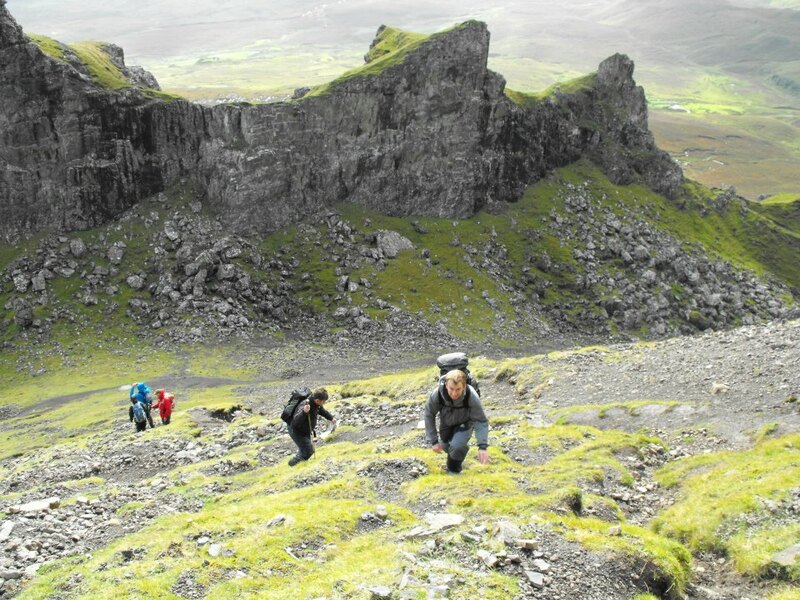 It is clear to see why the ‘Isle of Skye’ has been Voted 4th Best Island in the world by National Geographic magazine. It draws visitors from all around the world making it Scotland’s biggest tourist destination after Edinburgh. 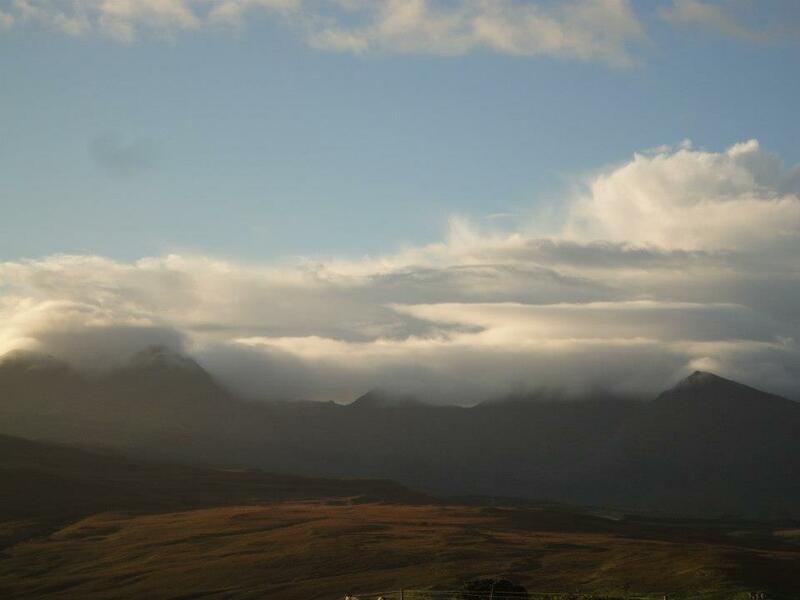 I like the quote I found, “It has been said that Skye is conclusive proof that, sometimes, God was just showing off’. This statement couldn’t be more correct in my opinion! 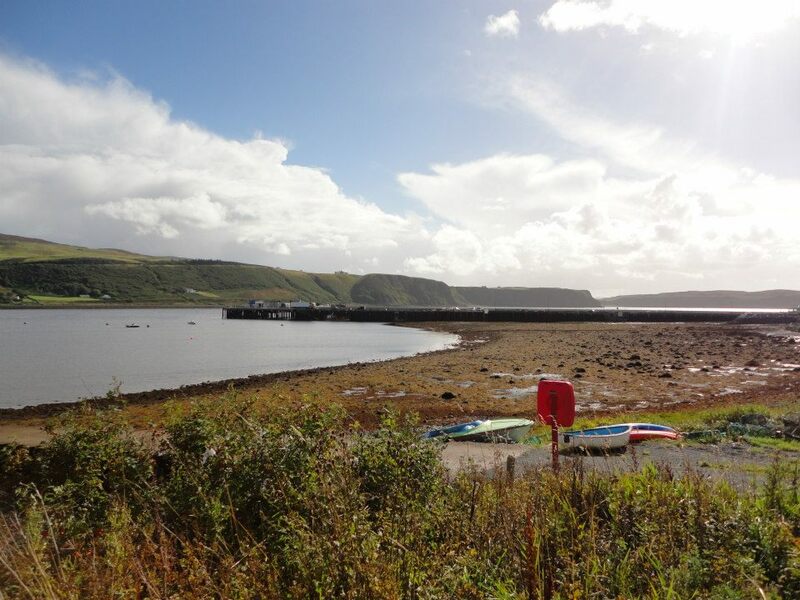 The Island has an interesting past dominated by the feuds of the clans, ‘MacLeod’s’ of north Skye and the ‘MacDonald’s’ of south Skye. I heard many fascinating tales and debate’s among friends over a few late night glasses of whiskey about the Isle’s magical past. Including the Vikings coming from Norway to try and take control of the island; their rule actually lasted, until the battle of Largs in 1263. 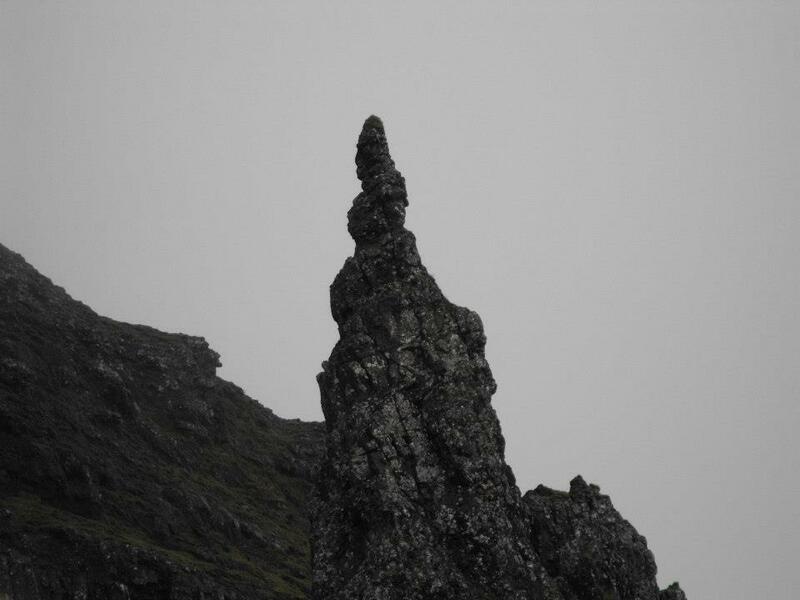 Which in its self is amazing never mind finding treasures years later near ‘The Old Man of Storr’. 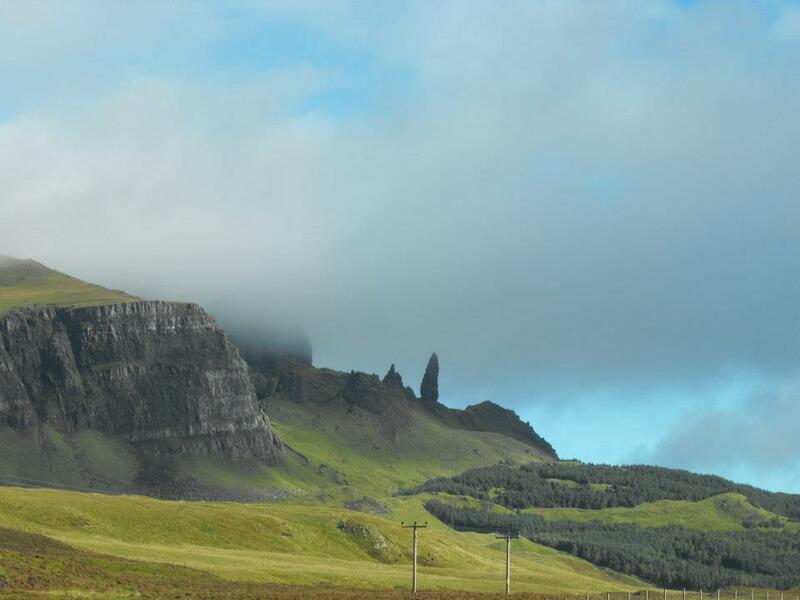 It was only after the battle in 1263 Skye came under the rule of the Kings of Scots. Clan feuds continued long thereafter though! The ‘Dunvegan castle’ is a major historical attraction, dating back from the 13th century. 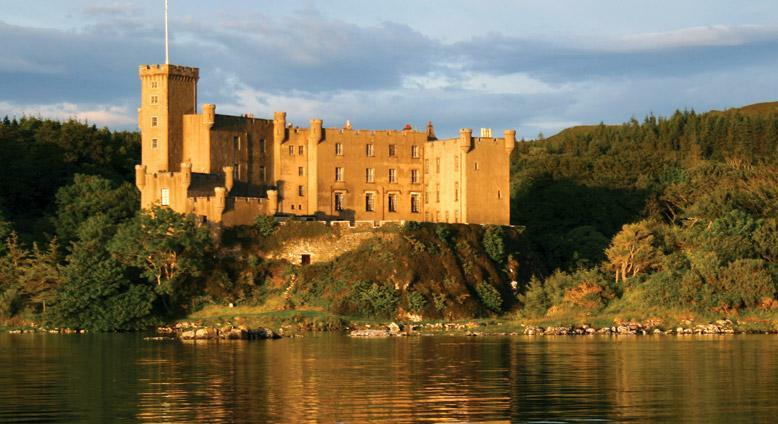 This impressive fortress has been the stronghold of the chiefs of Clan MacLeod for nearly 800 years and is rated as an interesting place to visit to get an insight into more of the Island’s history for the day. Ten of us in total had rented two self-catering cottages in ‘Edinbane’, booked through the website www.cottages4u.com. This was a great location to explore the island from with all the amenities we needed. 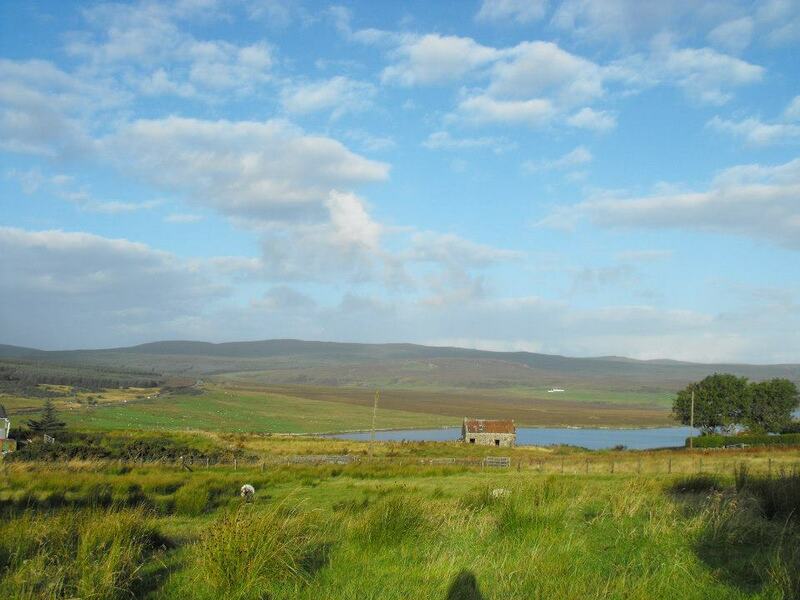 The view out of the living room window was like a perfect postcard at first glimpse, lush green forest, blue skies, sheep in the garden, mirror reflective loch and a rural stone out building in the distance – beautiful. I will mention you do need a car to get around here as the island is larger than I envisioned. We all travelled from different parts of the UK to meet here to share a fun, outdoor, adventurous week and that was certainly fulfilled with lots of laughter along the way. 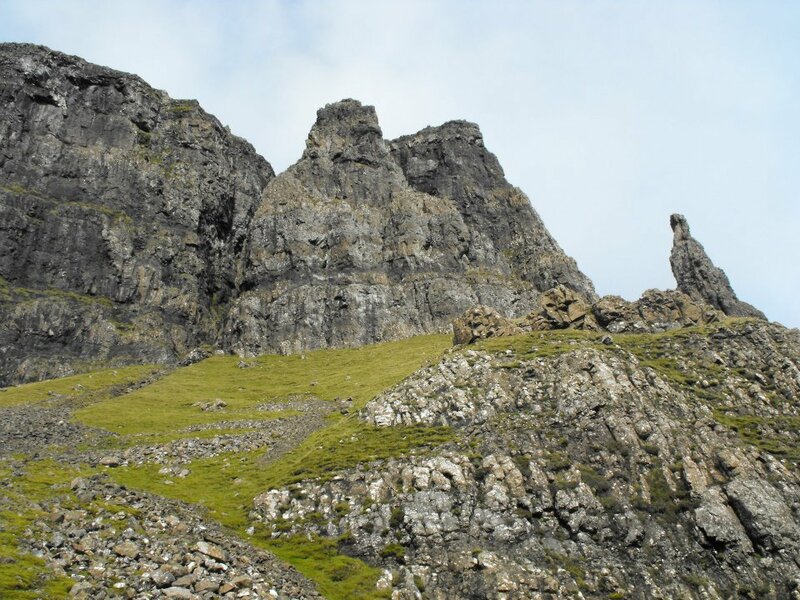 The following morning we made our way to Trotternish peninsula where massive landslips centuries ago resulted in the most fantastical rock forms and pinnacles I have ever seen. 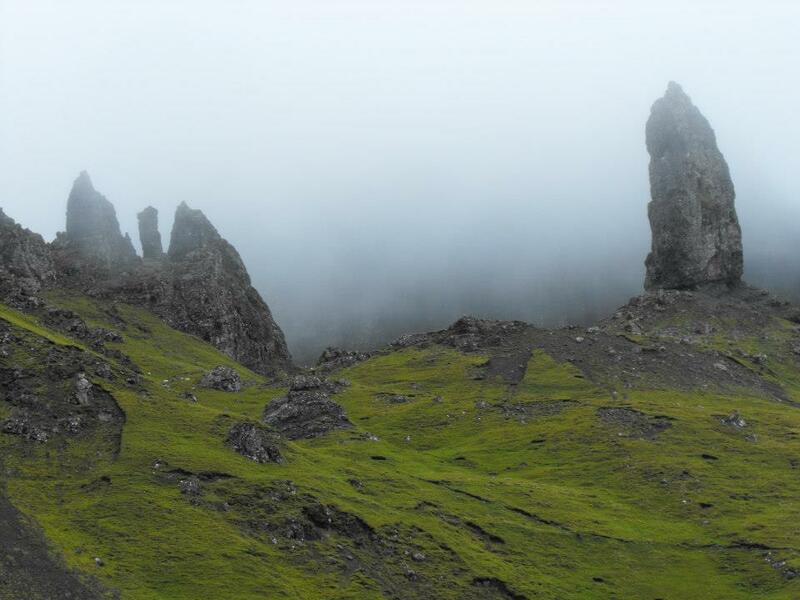 It is some special kind of phenomenon looking on at ‘The Old Man of Storr’ from a distance; so a morning walk to do an up close walk was very exciting. This was a magnificent place; you got a very eerie feeling ambling around as the clouds closed in on us. I was imaging the Vikings around these great rock formations and my imagination was running wild! There is a constructed path, used by many sightseers heading through the forest to the sanctuary area where you can gaze up at the pinnacles and cliffs including the 50m high old man – This is exceptional and not to be missed! 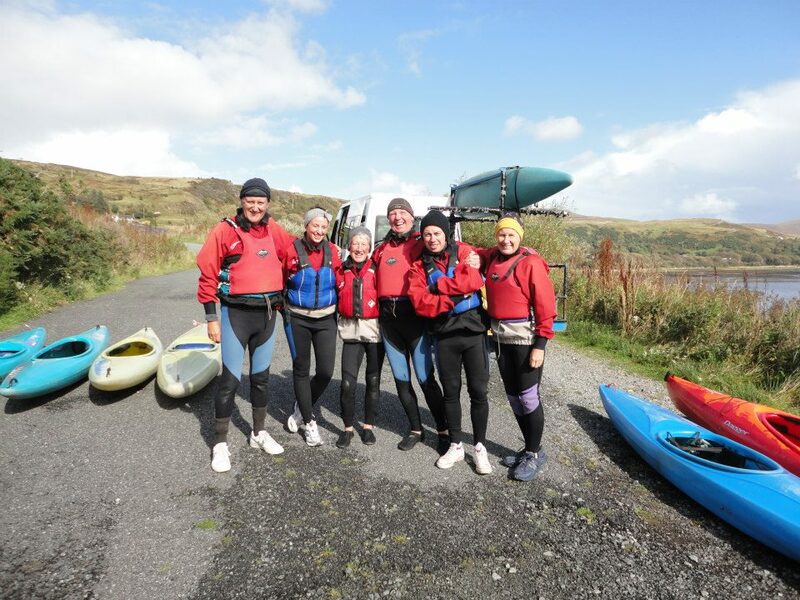 We had pre-booked an afternoon of sea kayaking with the ‘Whitewave outdoor centre’ costing £35pp, they kitted us up with all the gear; give us a quick safety briefing before we ventured out around the Trotternish Peninsula with a guide. I thought this was such a unique, fun, fantastic experience as we got the chance to get up close and personal with seals and jumping fish. You would be enjoying a relaxing paddle and all of a sudden a little head would pop up alongside you – ‘Seal’ I would excitingly shout! Once again Skye’s ever changing weather soon tried to challenge us with strong winds against us, waves getting choppier, driving rain in your face – How nice! This all of a sudden had gone from relaxing to a little extreme using all your strength to push forward whilst carefully not being taken by the tide sideways. With all getting a little serious out at sea, we headed back into the harbour to take shelter for a game of ‘kayak polo’ a first for me but such a great game bringing out our competitive sides, until someone fell into the cold sea – Uppps! This was nothing to do with me honest. Early the next morning my husband and I headed for the Jagged, dark, evil Cuillin ridge which dropped to the shores of a gentle, white, sandy beach. The contrasts were so vast here, making this place even more exceptional. The ridge is around 13km long, being the longest and narrowest mountain ridge on the British Isles. 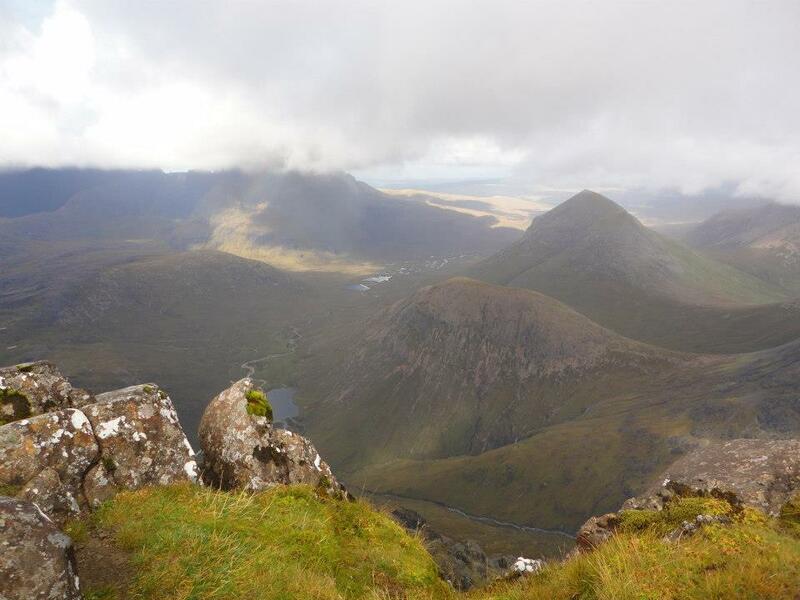 Including 11 Munros and includes a total ascent of over 4000m. The ridge itself is not a walk; it requires scrambling, climbing and mountaineering, being extremely exposed with weather changing instantly. This is not a place if you struggle with heights! It is quite a walk to get to the bottom of the ridge itself. 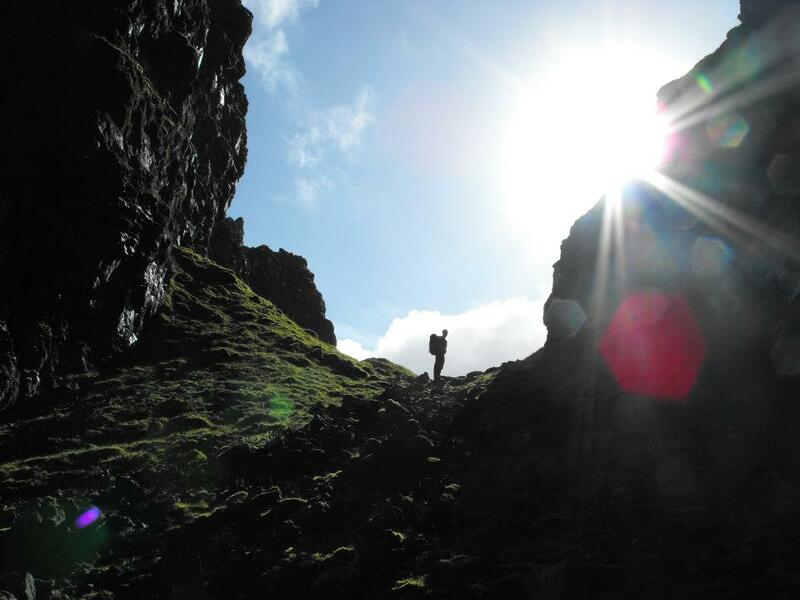 There certainly is nowhere else in the country to compare with these dramatic, challenging peaks of the Cuillin ridge; this is another level of mountaineering! 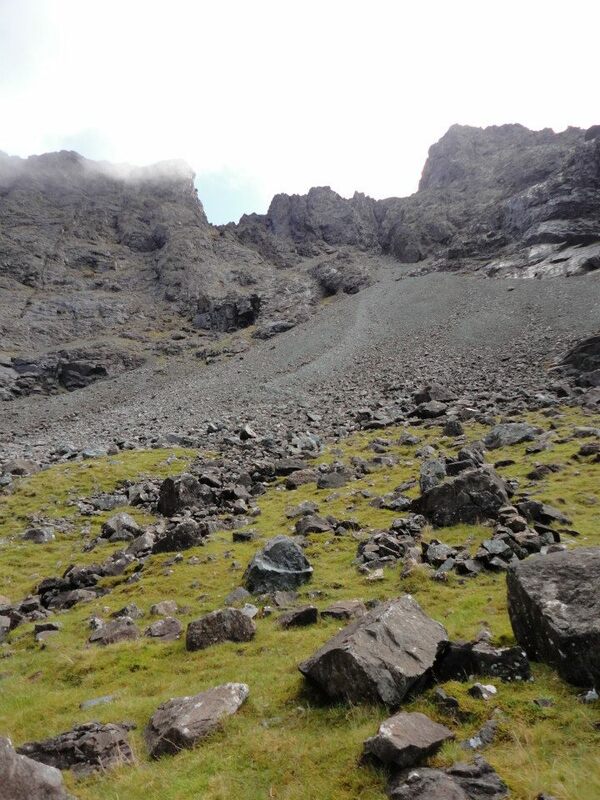 The geology of ‘The Cuillins’ is much younger than other parts of Skye, being the glaciated remains of a solidified volcanic lava reservoir some 60 million years ago. With not having the weather to attempt the full traverse of the ridge or the time, we opted to climb ‘Sgurr Alasdair’ or otherwise known as ‘Alexander’s Peak’ 3,255ft, the highest peak on the Isle of Skye and within the black Cuillins. We walked for about 2hrs to reach the basin of the ridge; this was a fabulous walk in itself following the path on the OS Map leaving the car at the Memorial hut. We passed a huge waterfall and walked through lovely countryside until we suddenly found ourselves surrounded by dark, high spikey peaks in a half moon shape – This was an amazing sight feeling pretty special. You could spend days, week’s even years coming back and back to walk, scramble and climb here and never get bored. Weather was on off showers with a mild wind when we started to climb up the loose rock up the ‘great stone chute’. It seemed the most obvious and direct way to reach the ridge, taking us a while whilst we carefully zig zagged our way up the moveable rocks trying not to cause a slide. The weather changed to sleet and hail near the top, it was pretty harsh. We made our way onto the ridge but didn’t take the risk in the weather to climb onto the narrow summit without ropes. So we took a few quick snaps and skied down the scree before having a romantic lunch in our storm shelter, ha. 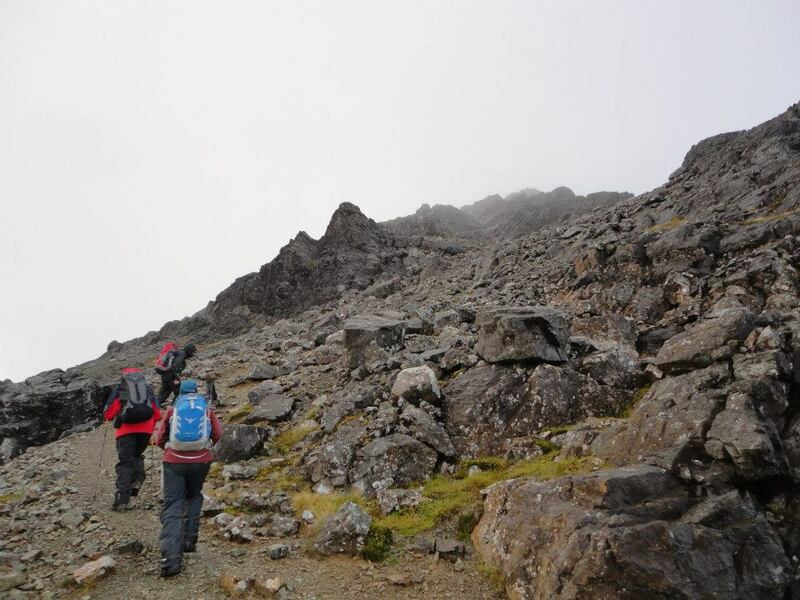 The next day we decided five us were going to head back to the addictive Cuillins range to attempt to climb the magnificent Munro ‘Bla Bheinn’ at 3,044ft high. It has its own car park on ‘Loch Slapin’ and you have to walk back on to the main road and over the bridge to find the path at the side of the river which winds its way through the heather and woodlands for a couple of hours. You eventually get to an open, flat area surrounded by random large rocks and high, scree slopes before you actually start steeply heading towards the ridge. It was not an easy walk with quite a bit of scrambling in parts. 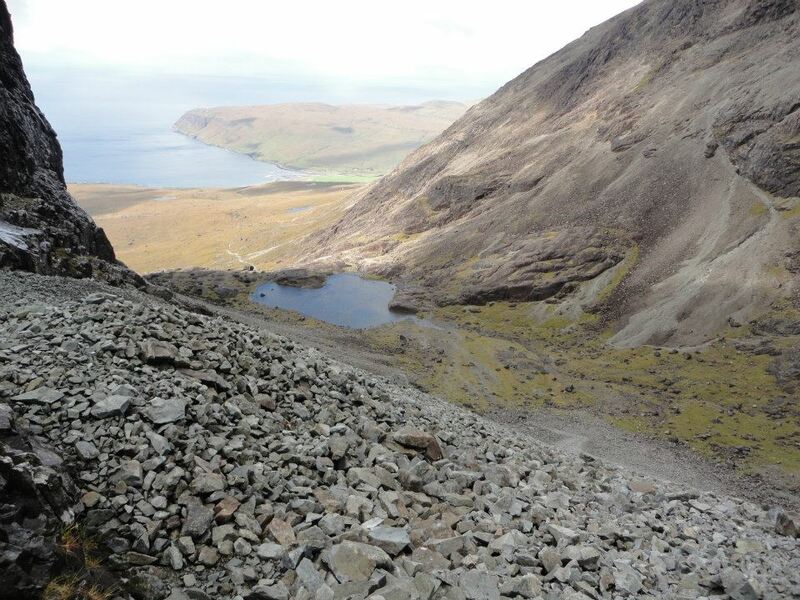 The views as you climb are breathtakingly worth every step opening up a vista of the red hills, Isle of Rum and a large part of the North West highlands. The weather was kind to us this morning with sunshine and light showers. 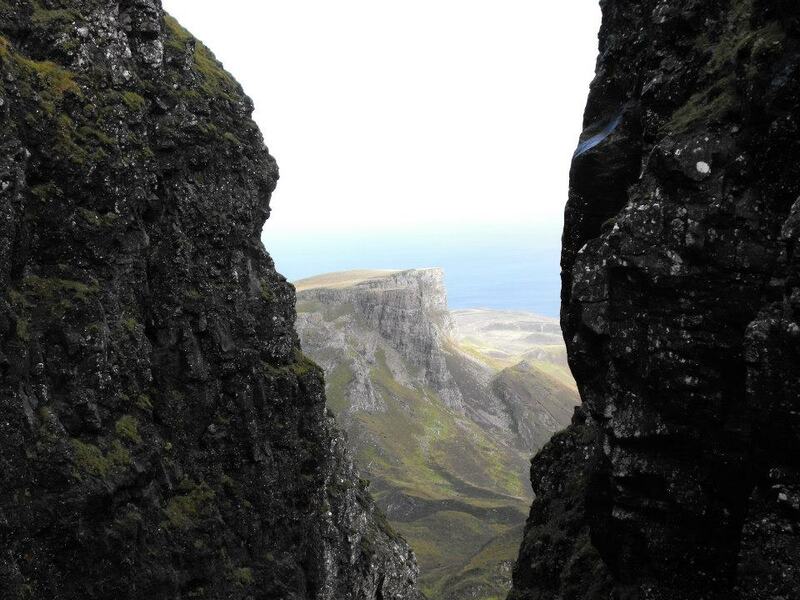 There were some great views down gulley’s and crags, but be careful don’t get too close to the edge! But this is nothing compared to the sight from the summit. 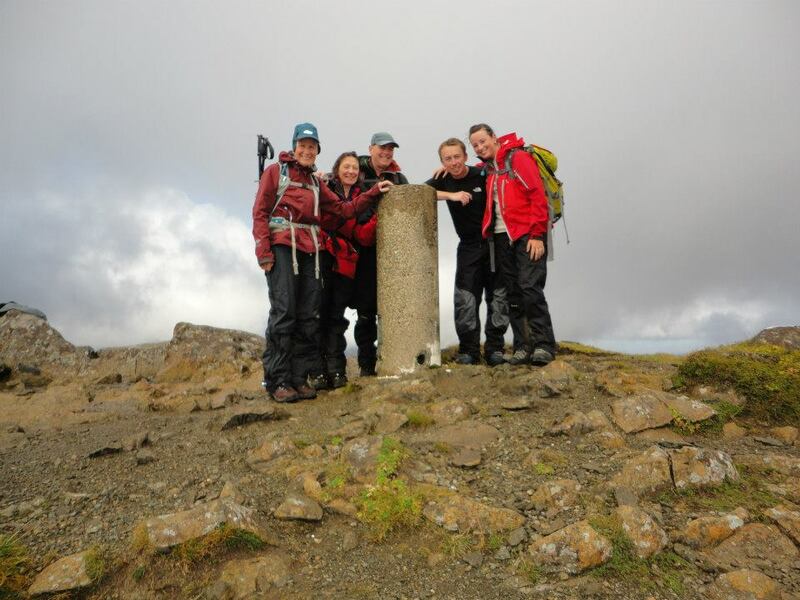 There is a trigpoint on the top with quite a bit of space on the summit. 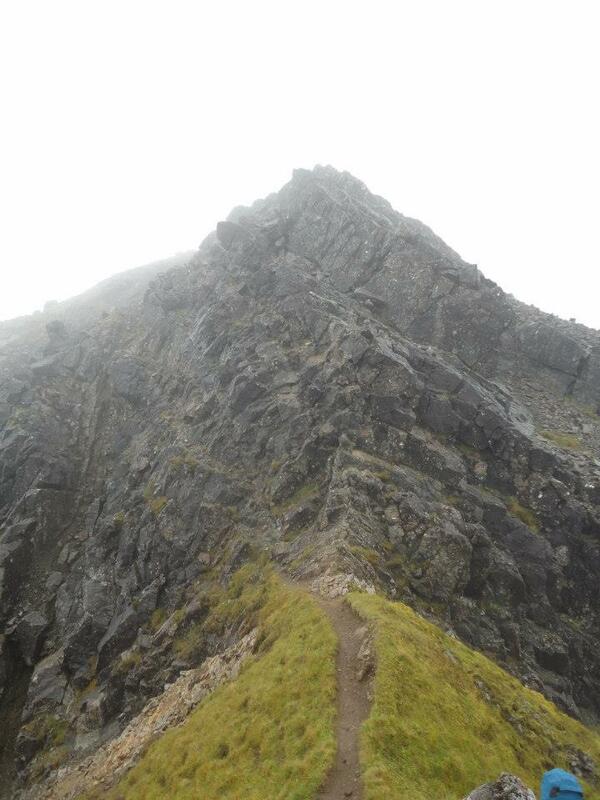 We walked across the narrow ridge to reach the south summit realising the path had fallen away so we roped up and climbed safely around the wet, slippery rocks to the southern summit. I think whilst walking in Skye it would be a real pity to miss out on what I may rate as some of the best summit panorama views in Britain. 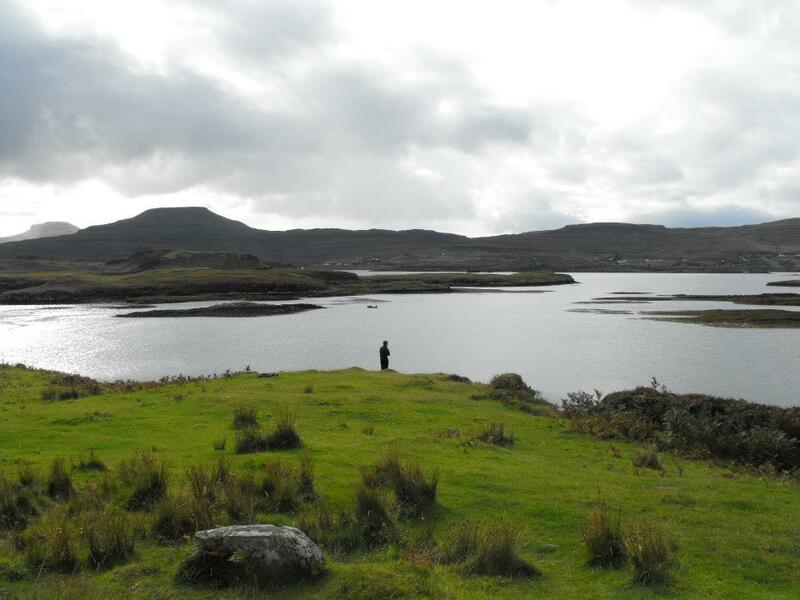 As we descended the views of ‘Loch Slapin’ were just picturesque. Mountains I will never forget during my lifetime that’s for sure… Back to the cottage for some homemade cooking and a well-deserved drink I think! 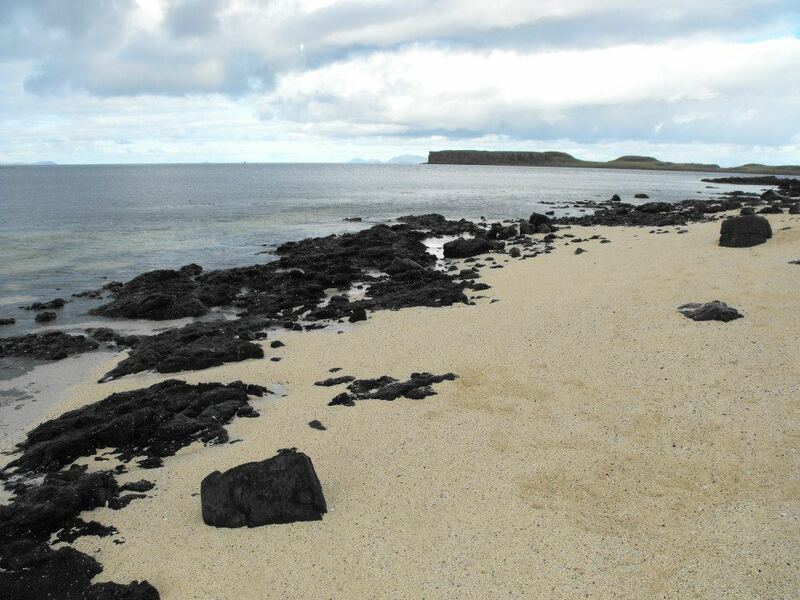 The next day was all about relaxing and taking it easy, so we all headed to the ‘Coral Beach’ at Claigan a real hidden gem. The coastline around Dunvegan was absolutely gorgeous like somebody had zapped this little white bay in from the Caribbean. We took a gentle stroll for a few kilometres to the accessible, white sand beach. 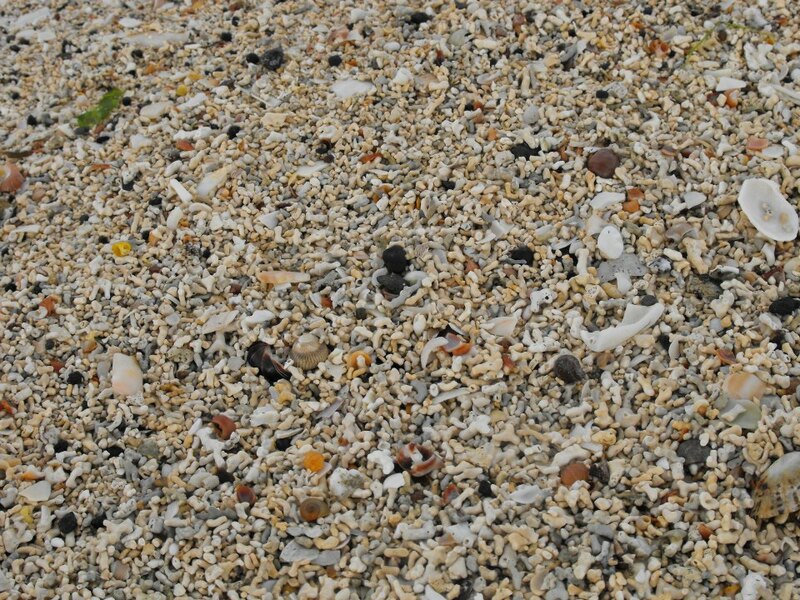 Despite its name and all the tales of the Gulf Stream, the beach is not made of coral at all. It is actually made up of thousands of pieces of sun bleached algae. Still very beautiful! 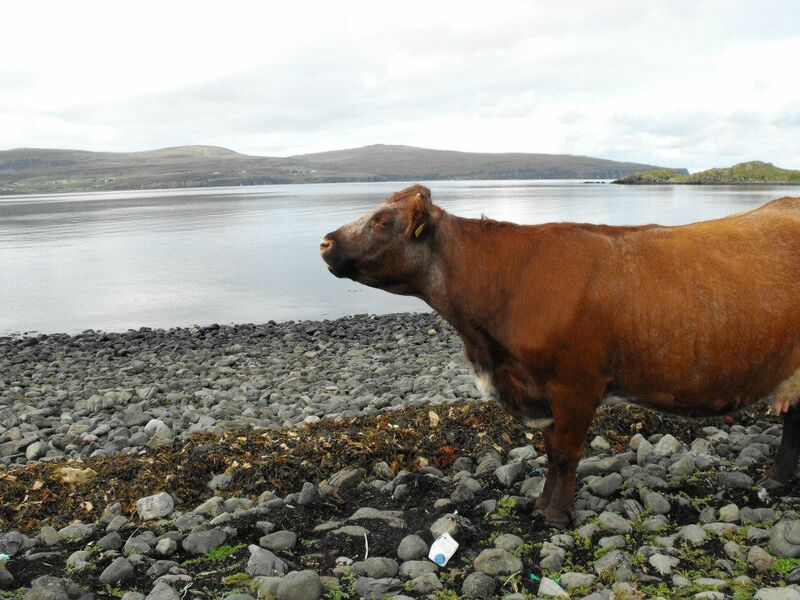 There were cows grazing on the seaweed which seemed so used to humans walking by, I found this very entertaining and dreamlike. 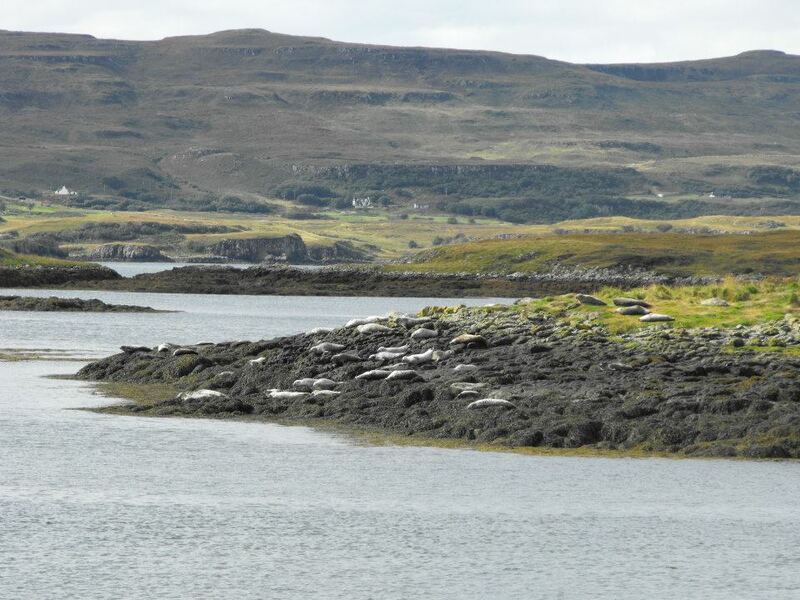 Whilst driving from Coral beach towards Dunvegan castle we looked out towards the sea and detected movement on the nearby rocks as the tide was low. Bingo, Jackpot! We had only discovered a large seal colony, we clambered down as close to the sea edge as we could and observed the playful sea mammals so close for hours as they swam and jumped through the water and got themselves back on to the rocks. The also attracted a variety of birds, we saw a heron and some crows but no sea eagle I’m afraid. We felt so lucky with what we had just witnessed; it really was an exceptional moment as I had never comprehended anything like it before in my life. 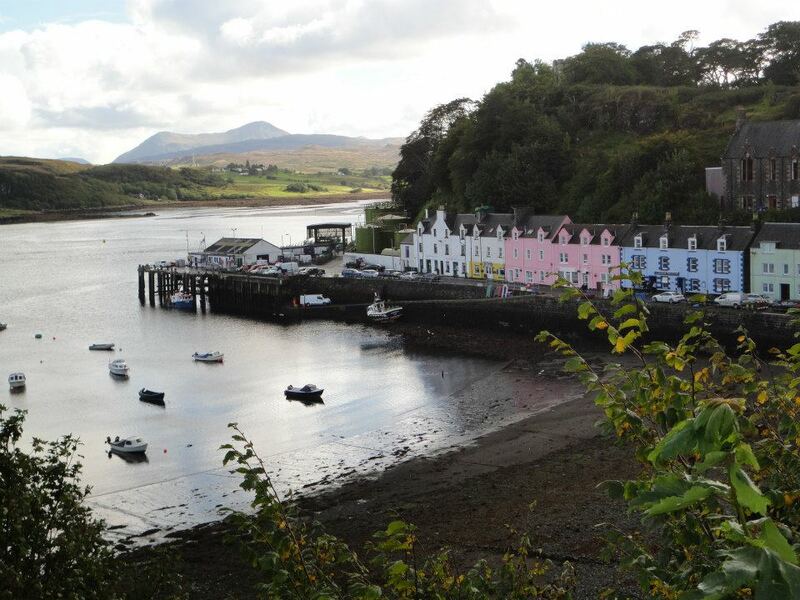 Skye’s main picturesque town of ‘Portree’ boasts bags of colour and character with a small, pretty, natural harbour. There seems to be lots of B&B and hotel options here and a popular base to explore the island from. We ambled around the small strip of boutique shops missing out the plentiful amount of pubs here. 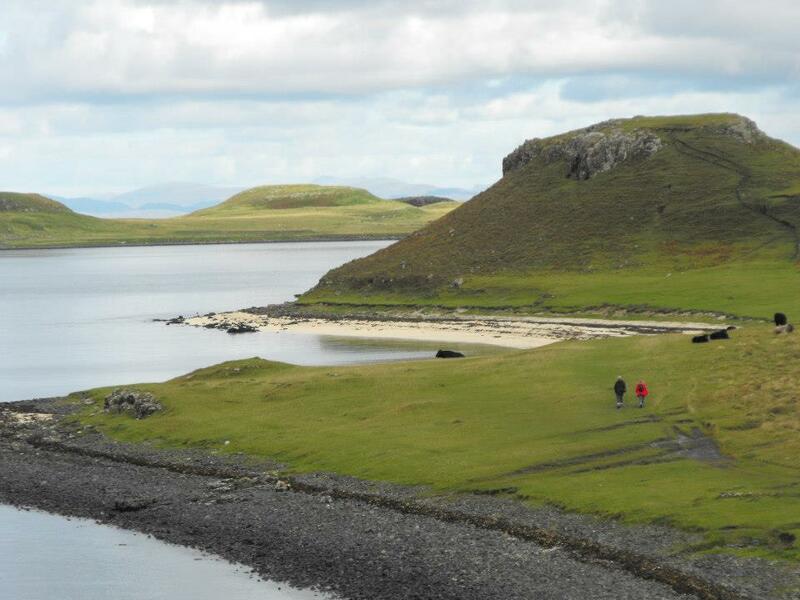 Great place for a bar crawl in Skye! 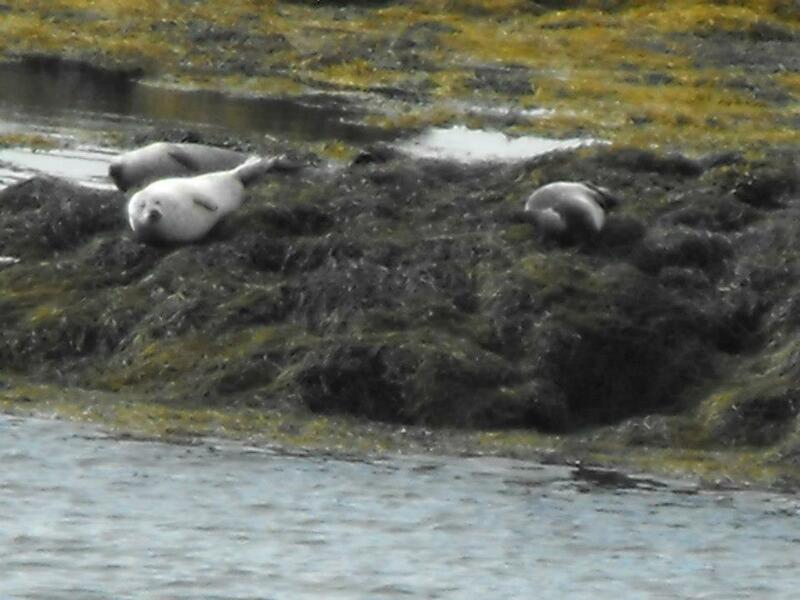 We went down alongside the harbour; there is a selection of wildlife spotting boat tours which go from here. Friends opted for the Sea Eagle boat trip and said it was excellent value at £16pp. We opted for the fish and chip shop instead – delicious, we got chips and a dressed crab to go and ate them at the side of the harbour until it started raining and we ran for shelter on some steps under a tree! I also discovered the film ‘Made of Honour’ was filmed here. Food on the Isle of Skye is not limited either, most nights we took it in turns to cook in our cottage taking a more relaxed approach to the evening sharing stories and laughter of the day’s adventures with a bottle of wine or should I say a few, ha. A few games of drunken Jenga and planning walks for the following day! We did get the opportunity on our last night to visit ‘The Three Chimneys’ restaurant famed for its exquisite cuisine, fresh seafood and beautiful views. You need to make reservations a few weeks in advance here should be noted. A little over priced but well worth it as a special treat! They do have a lunch menu which is cheaper and better value for money I believe. 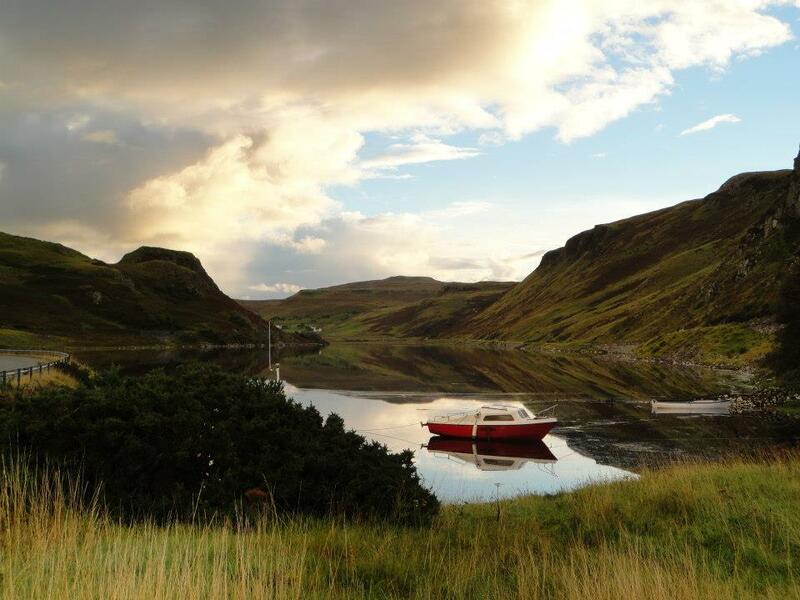 The Isle of Skye is truly a place memories are captured forever! A true walker’s paradise, I would say! It seems like a foreign land of overwhelming beauty or an unreal world, but actually it’s just up the road and within reach to all in the UK. I could have easily stayed longer than a week – maybe a year would have done it, Nahhh not enough time! I will return one day that’s for sure! I came here searching for something else, but this enthused me regardless. Enlightening stuff! I really loved the photos. Now I can see why it is considered the most beautiful Island in the World. It is definitely my next destination or at least a new thing to do on my bucket list 😉 Happy to see you guys having a great time there! Happy travels! Absorbing info and superbly written. Keep up the great stuff!